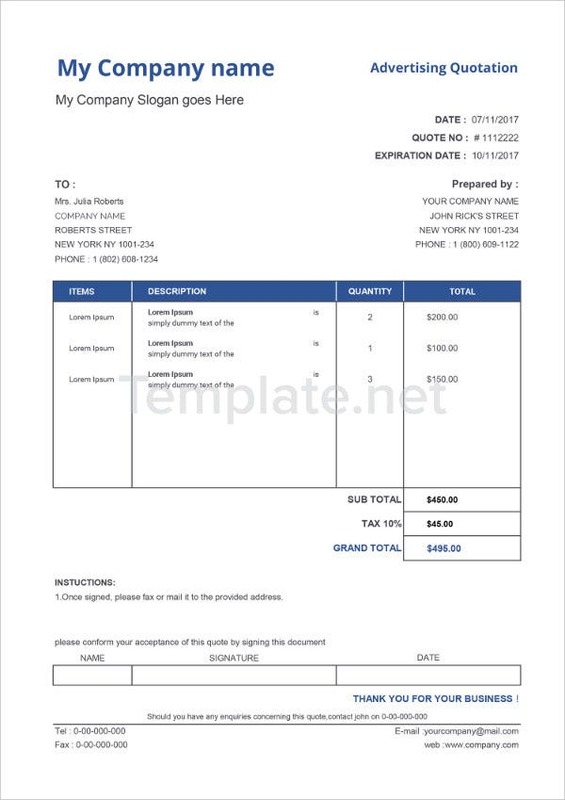 When a business transaction takes place between two parties, a formal document is commonly used as a reference to their agreement and as an assurance of that transaction. This is where a quotation comes in. 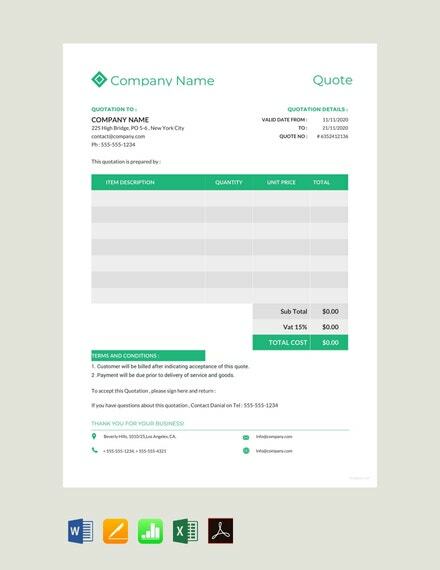 Quotation samples follow a specific format that reflects the estimated expenses, terms of agreement, and warranties. 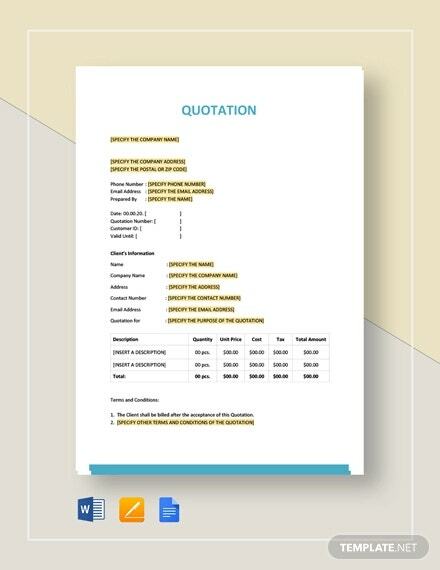 The process of quotation making is usually done by the supplier of the goods and services as requested by the purchaser, and this quotation usually contains the information needed by the buyer regarding the goods. If a buyer accepts the quotation from the seller, it signifies that their agreement has been sealed. 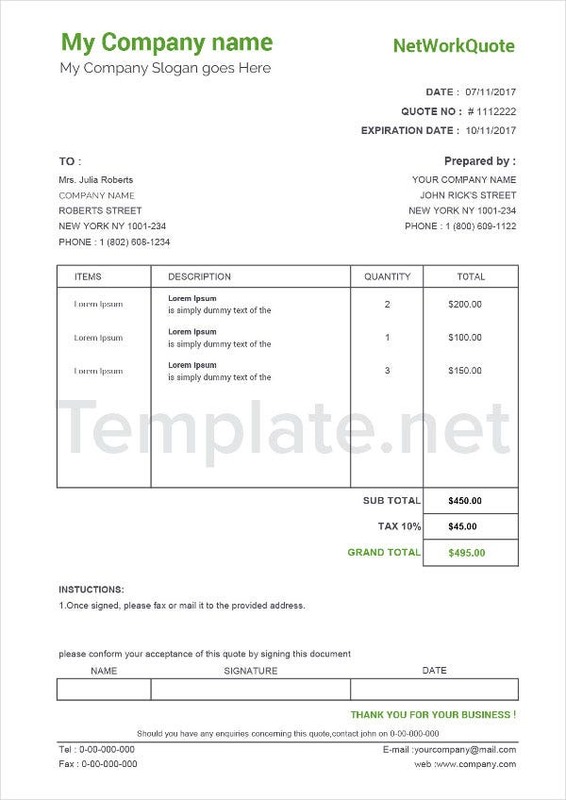 You may also see quotation templates. 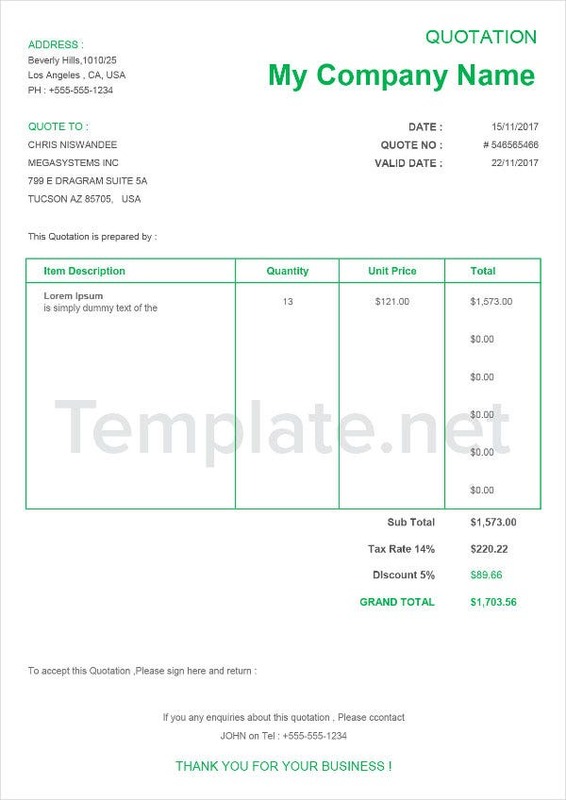 the total amount to be paid by the buyer. 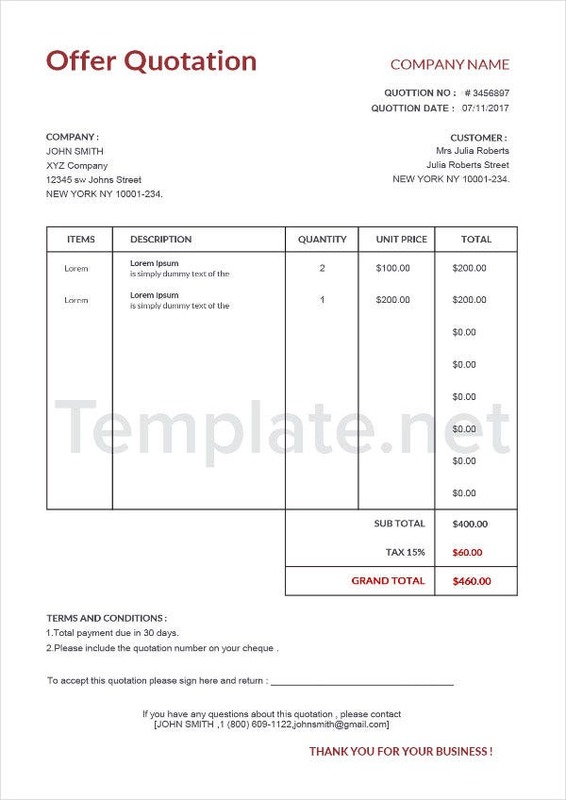 It is similar to a receipt but is issued before a transaction has been made. 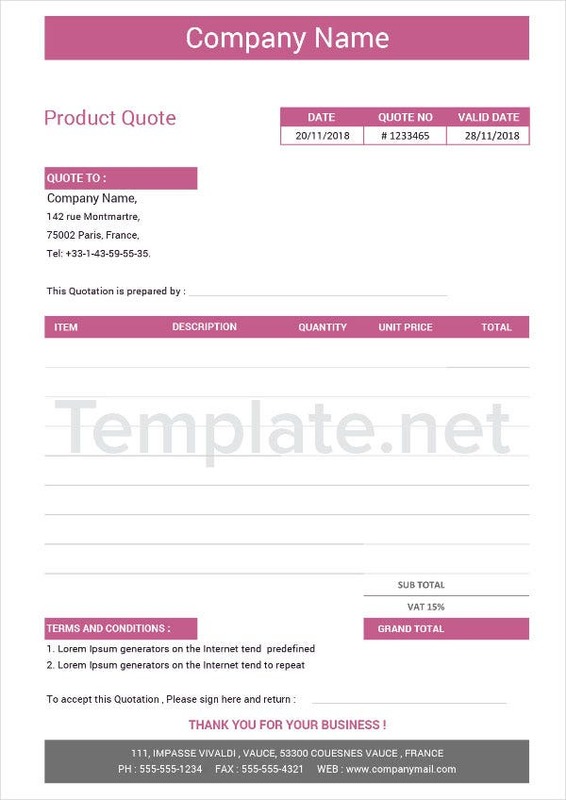 On the top-most portion of the form, write the name of your company and specify the title of the quotation next to it or below it (alternatively write the title first before the company name). Under your company’s name, write the street address and the contact details of your office. 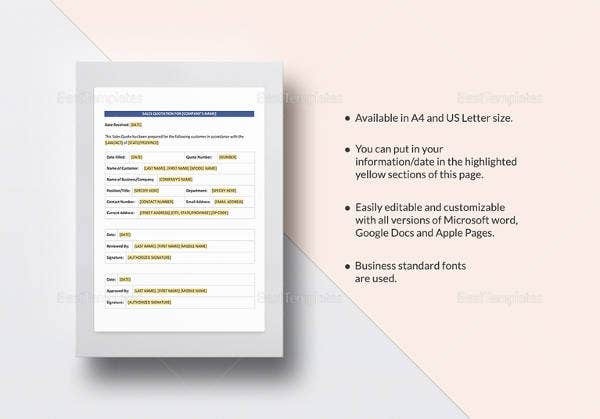 Include the details of the quotation: details of the requesting company (their name, their address, and phone number), the date of writing, the quotation number, and the date of validity. 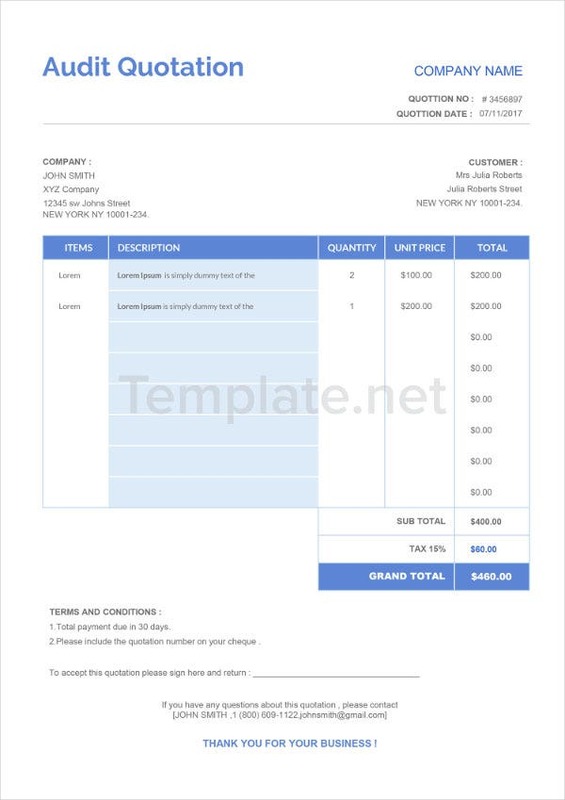 In a table, assign three columns for the name of the item, a brief description of the item, and the price for each item. 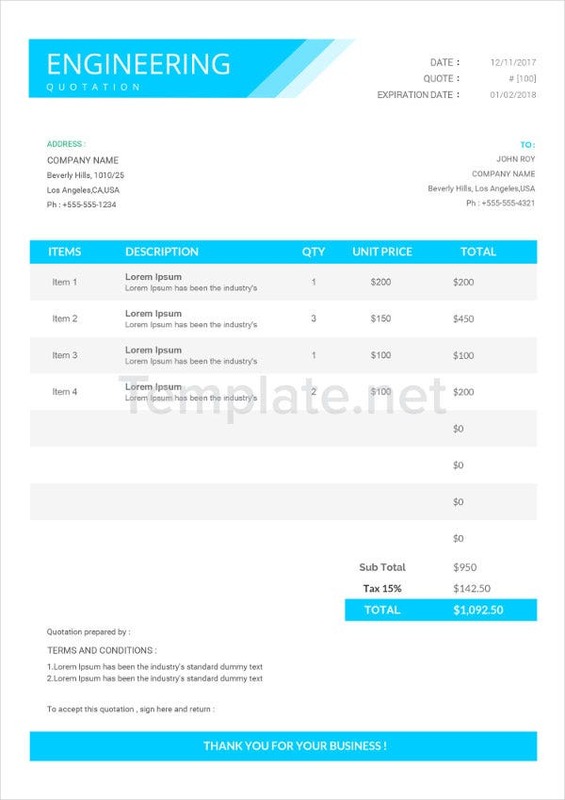 Leave space where you can write the sub-total price for all items, the taxes imposed, and the total price to be paid by the buyer. 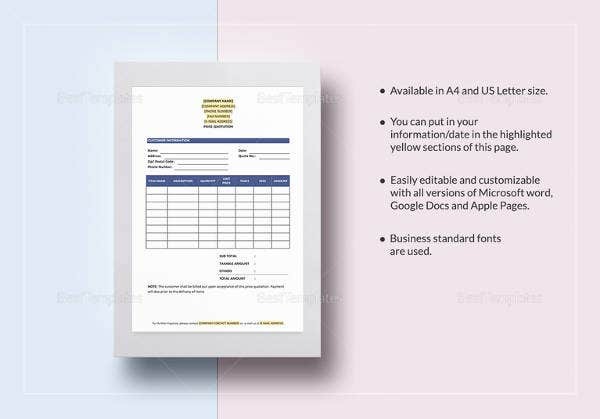 On the bottom portion of the form, write the details of the person who prepared the quotation, their name and their contact number, as well as the name of the person accepting the form. 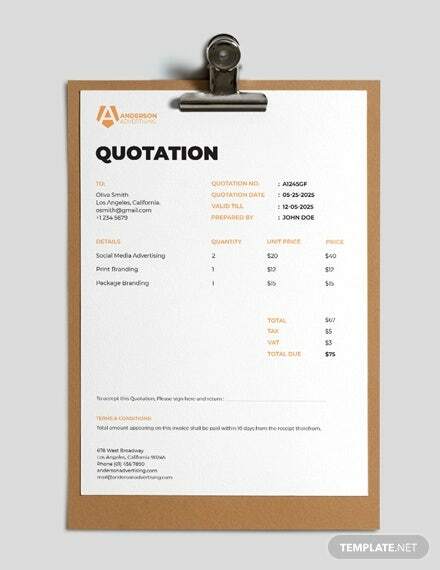 For another type of quotation, check out our collection of Price Quotations. 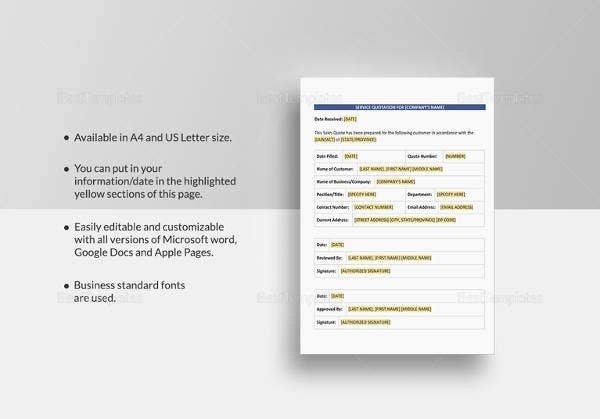 It is legally required that you write the business details of your company—the name and contact information. 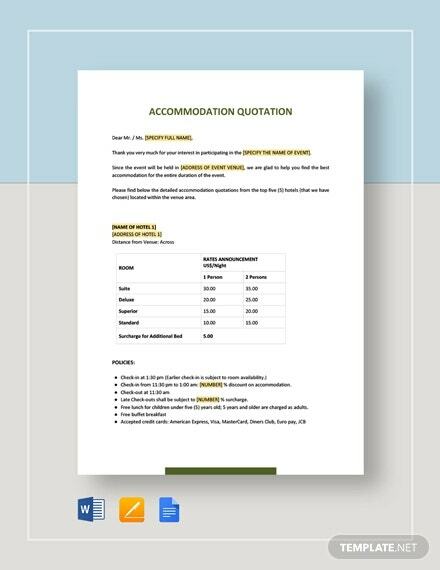 Include the breakdown of expenses. 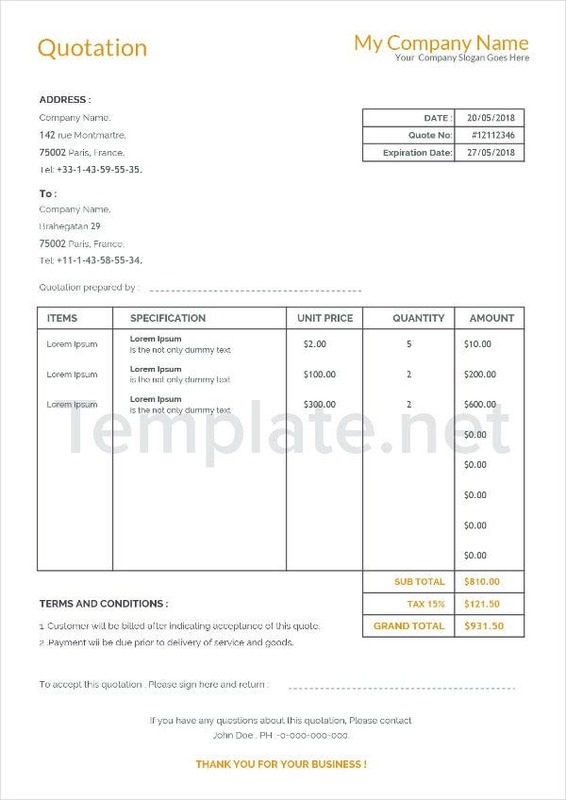 The items involved, and the expenses for the manpower and materials used. 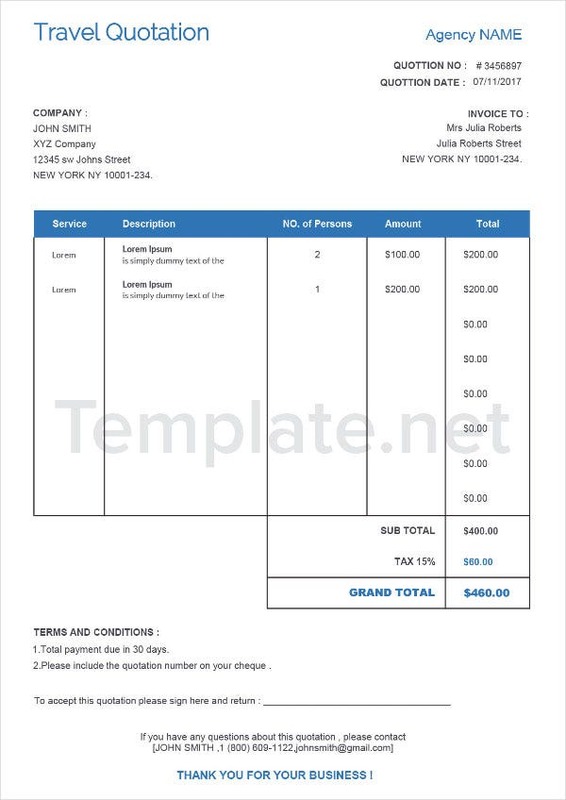 The total amount of the expenses for all items should be indicated, including the taxes involved. Don’t forget the variations, specifically the conditions that may affect the cost, whether those may lead to more or lesser expenses. 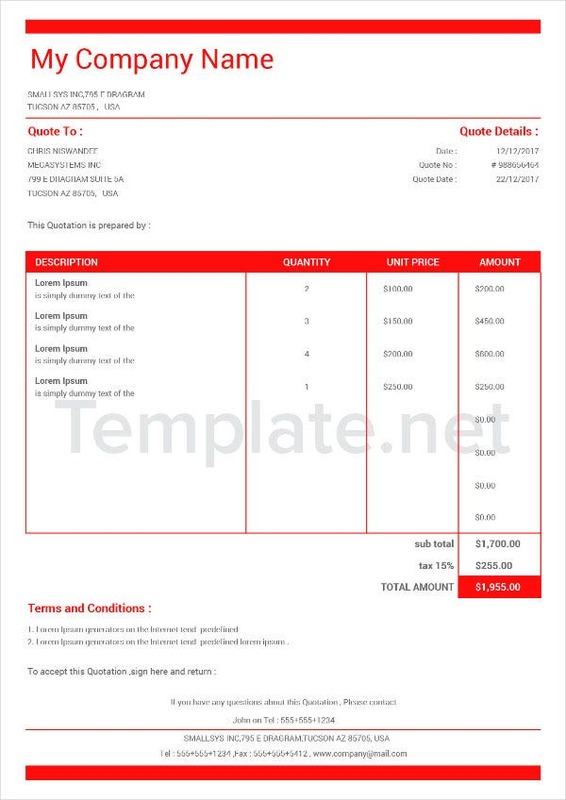 The terms of payment is one aspect that should definitely not be missed. 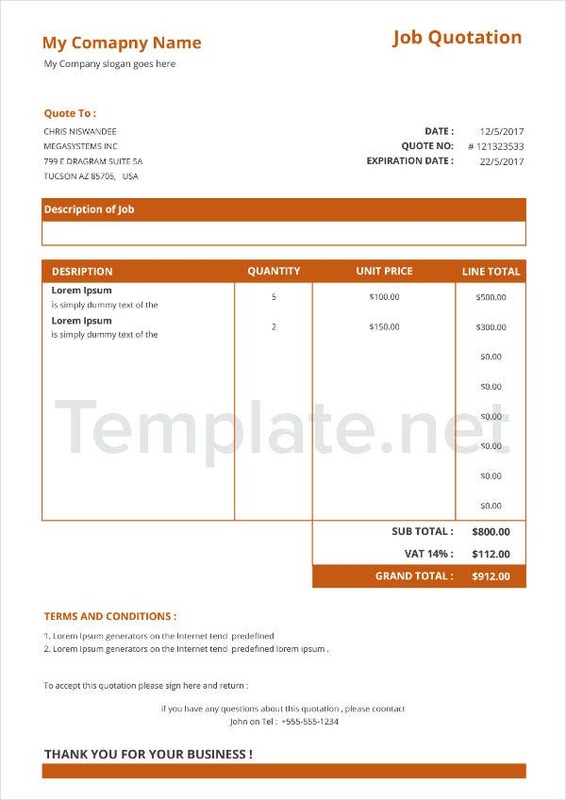 This involves the frequency of the payment, the amount to be paid for each payment, and the deadline that the payment needs to be fully paid. Identify the payment methods. 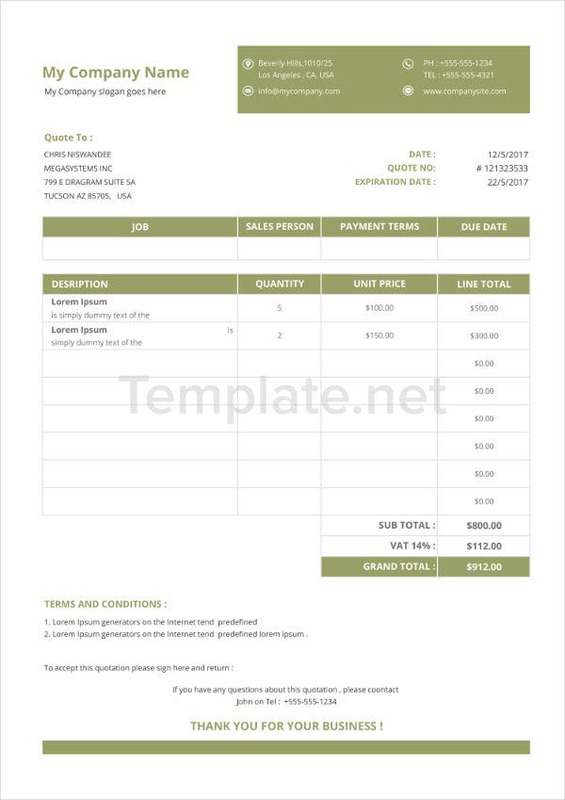 A specification on how the buyer will deal with the payment, whether through cash, cheque, or card should be foremost in your mind when creating a quotation. 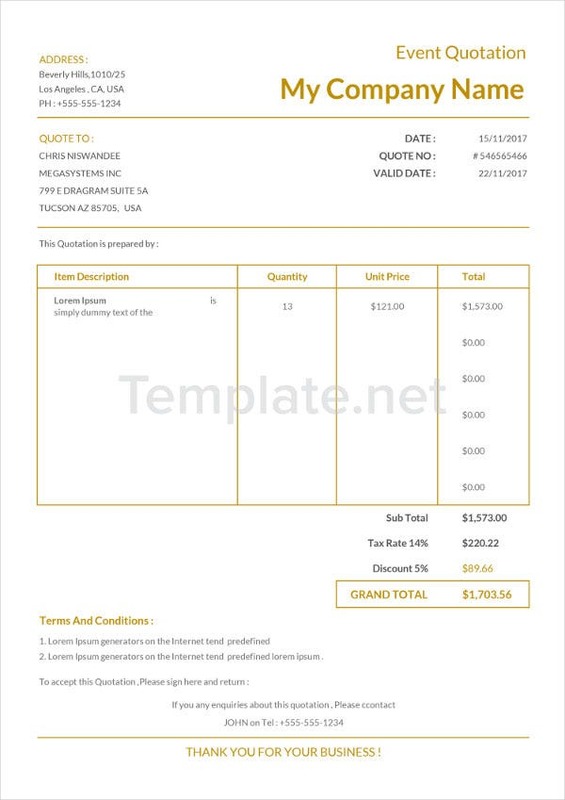 Indicate the quote expiration, the date that the quote should be accepted by the purchaser. To formalize the agreement, the purchaser should place their signature on the space provided for them and the date of the acceptance. 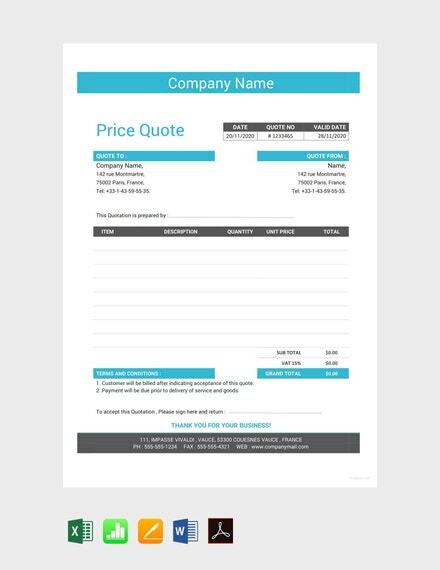 For more quotation templates to choose from, search for the following using the search tool on the upper right corner as we have Quotation Formats in Doc, and Sales Quotations available in other parts of the site. 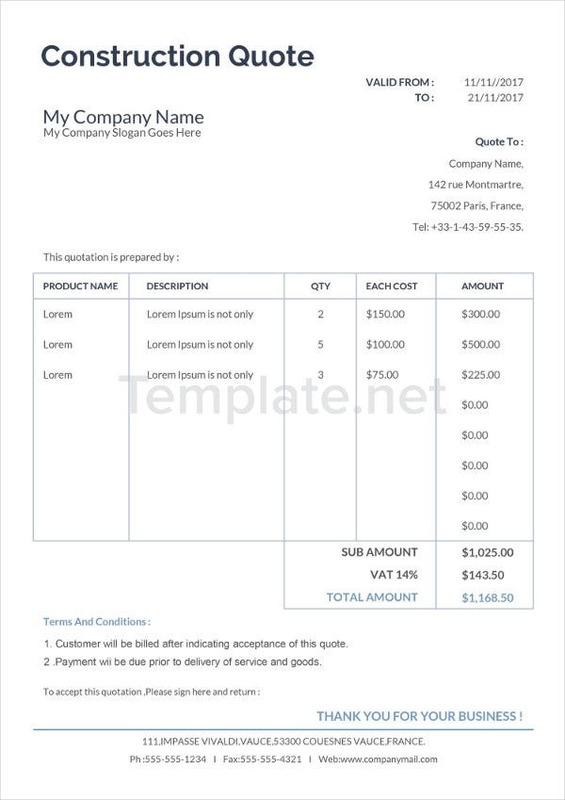 But you may also refer to Sample Business Quotations for more templates. 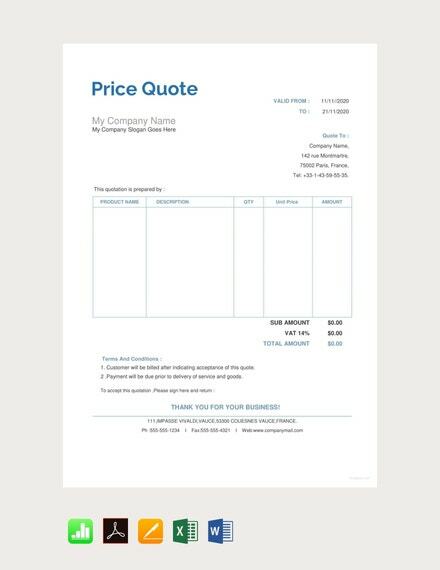 Why Are Sales Quotations Good for Businesses? 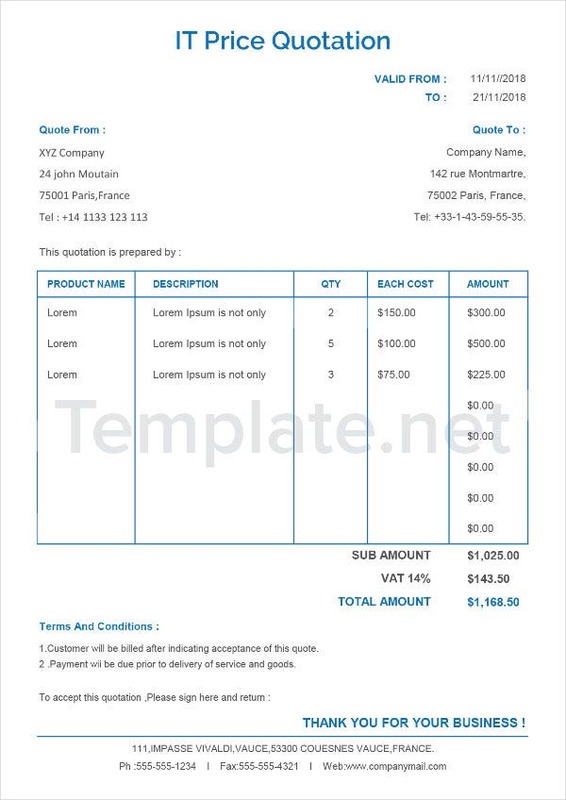 can help the supplier and the purchaser understand each other and come into terms more easily. 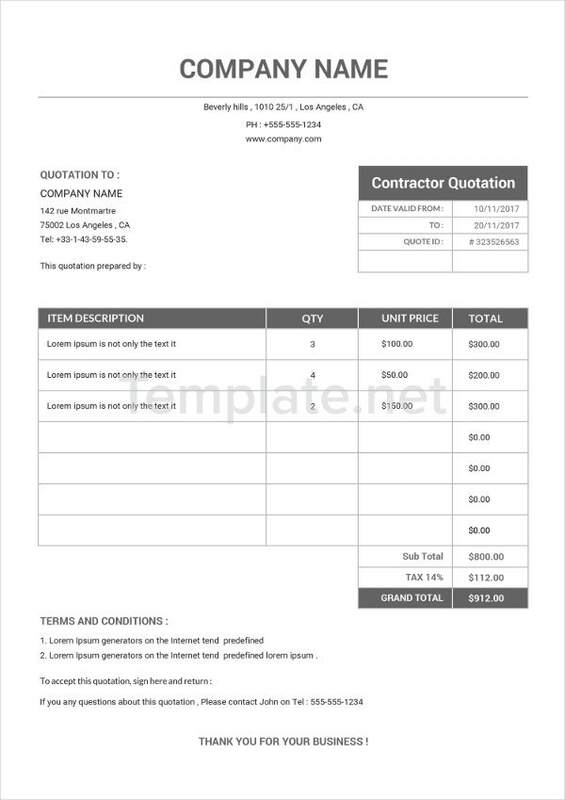 clearly indicate the specific prices for each item, including the cost for the labor and materials involved, and the terms and conditions agreed in the business. can help motivate a client to make a decision and avail of the products and services offered. 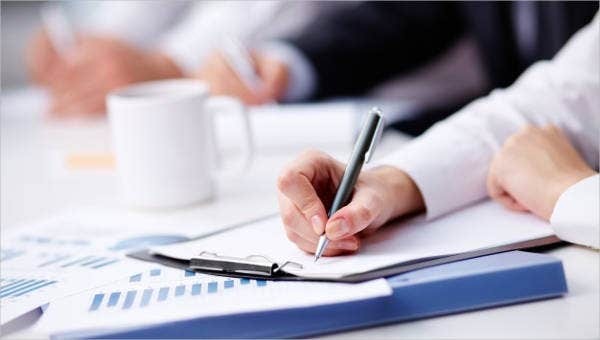 are legal documents that can protect both the supplier and purchaser if ever problems arise during or after the business transaction. help build a good business relation between a supplier and customer and encourage transparency between them. How Can You Make a Sales Quotation More Effective? 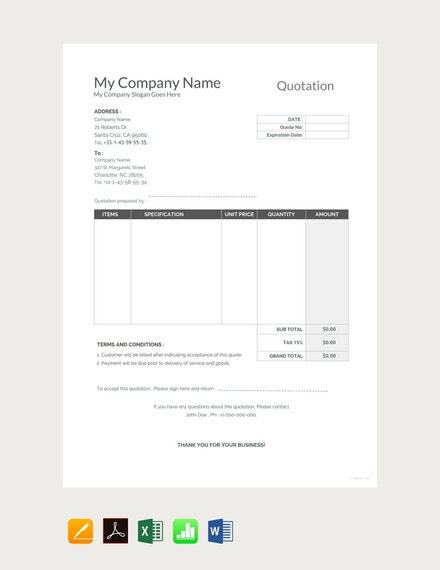 Write the quotation as soon as the customer requests one. Describe the item briefly and directly. To be able to do this, you must at least have an idea about the item and what it does or what it is for. 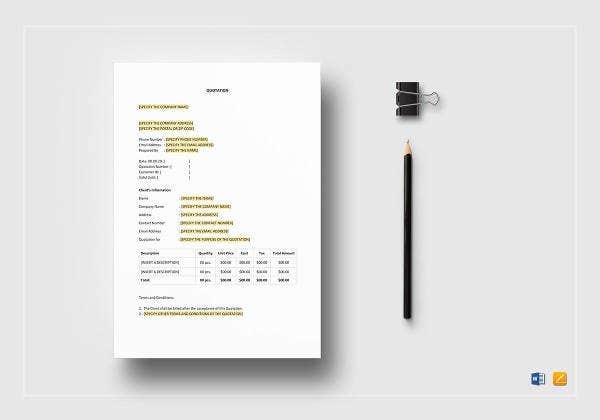 Write down the terms and conditions that apply to the business. 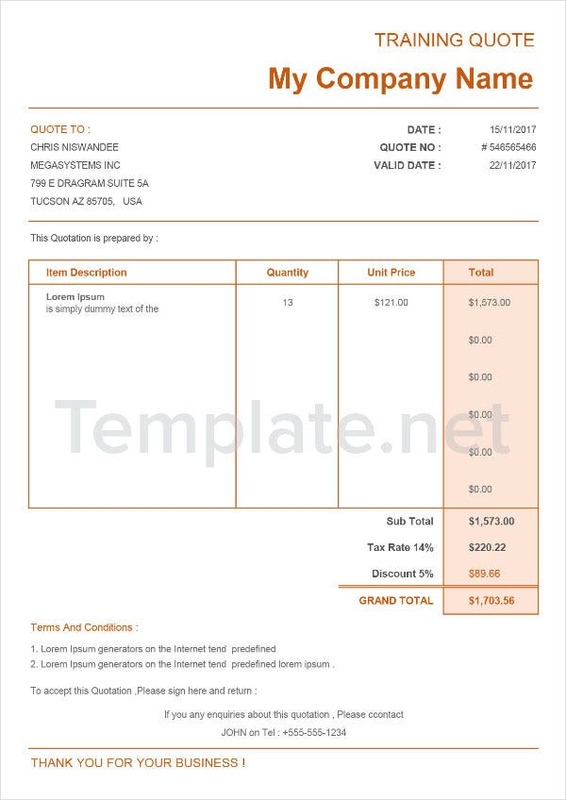 Clearly indicate the percentage involved for the VAT and the equivalent amount. 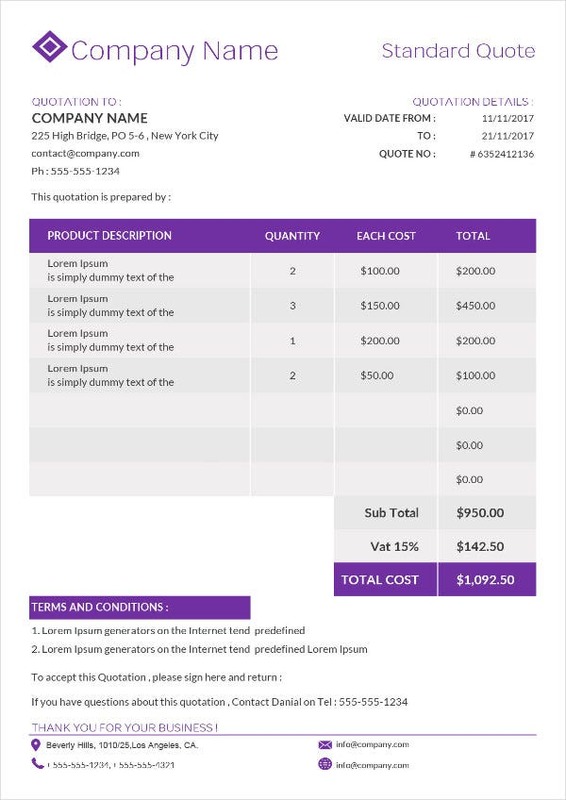 Leave a contact number for the customer in case would need some clarifications regarding the quotation. It may either be your number or a representative from your company. 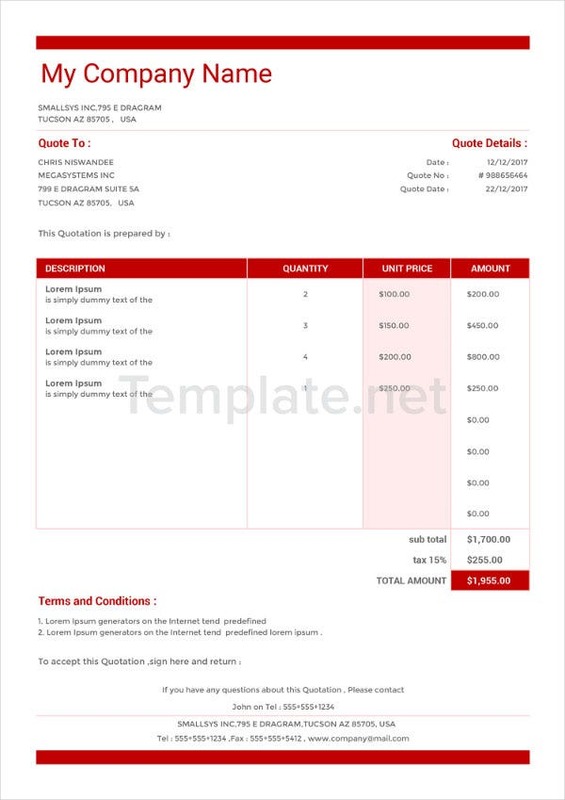 For more templates about sales quotations, you may also check out our collection of Quote Sheet Templates. DO give a detailed information about your company by providing relevant pictures, achievements, the equipment you are using, your staff, the facilities, and other useful information that will help promote your company. DO share to the client your website or social media page, if ever you have one, to provide them with additional information about your company. 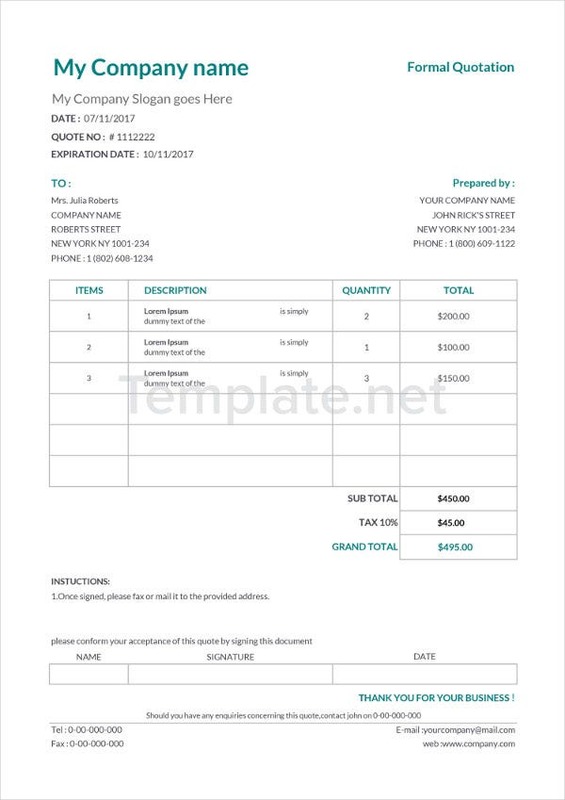 DO make follow-up calls, return calls, and respond to emails right away to show that you are sincere in serving their company, and also to give a good image on your company. DO give surprise promos, discounts, or price cuts. In relation to the last bullet point, DON’T give hidden costs forcing the customer to pay more than what was agreed. 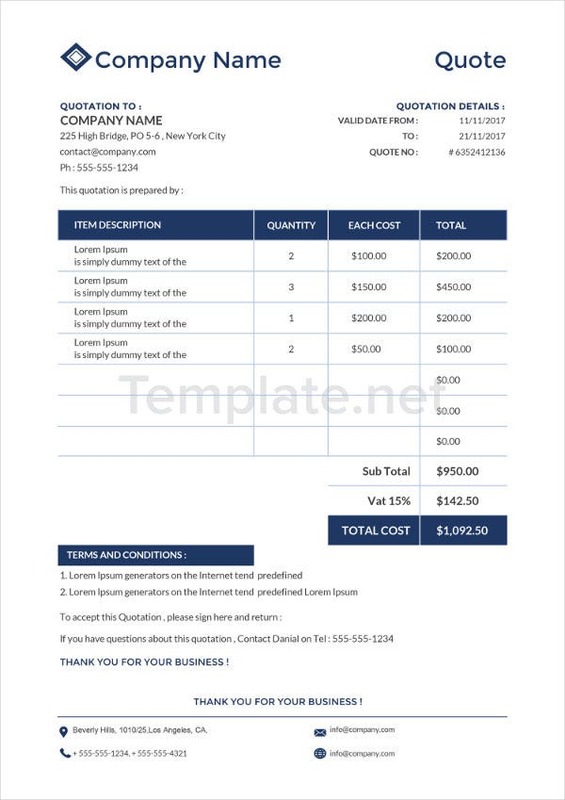 This will lead you to lose prospects as well as damage the reputation of your business. DON’T give your prospects a difficult time by asking for requirements and documents even before the transaction has been agreed upon. 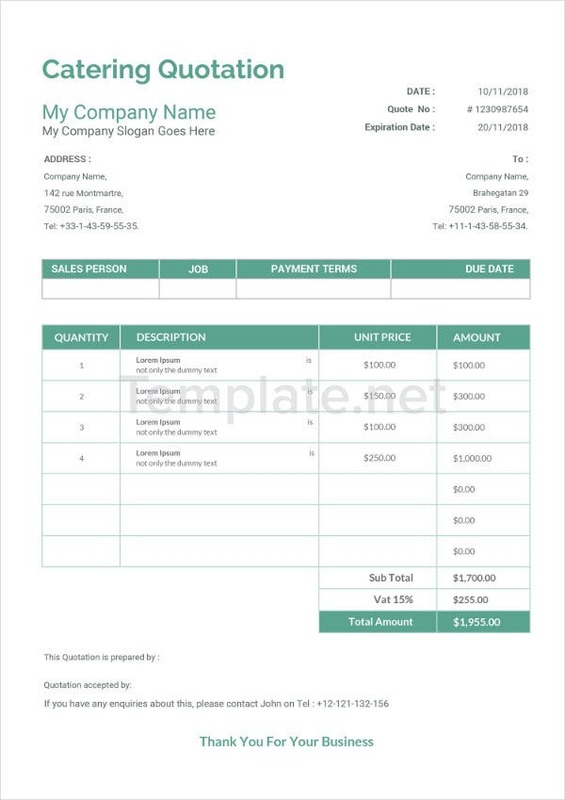 These documents can requested once the business is already ongoing. Unless necessary, DON’T change the terms and conditions that has already been agreed after the business has commenced. DON’T argue with the customer even if you think you are right. It is better to settle issues like this in a professional and rational manner. 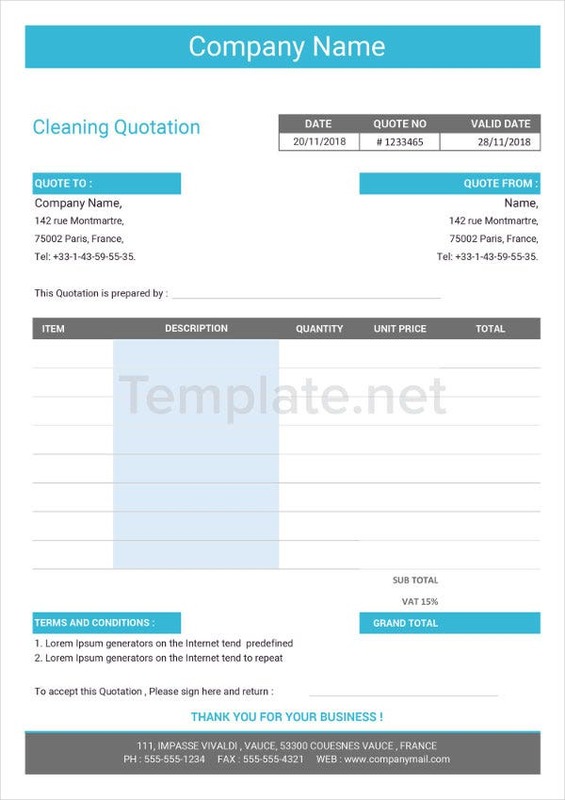 If you are looking for other types of quotations, then check out Quotation Formats and Quotation Templates. 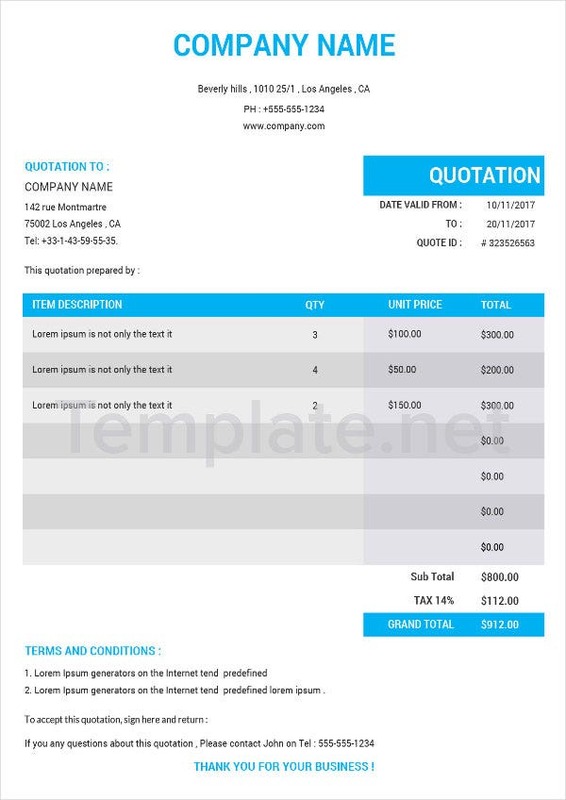 However, if you are looking for templates used in the construction industry, you may also search for Construction Quotations using the search tool.